Photo Credit to LaurasCraftyLife.com. Read her article on cleaning your dryer here. Keeping your dryer lint free takes very little time and will serve you well in the long run. Regularly cleaned dryers work more efficiently – saving energy and money – because they have better airflow. They are also safer as lint deposits in the dryer pose a serious fire hazard that is easily defused by regular and careful cleaning. Avoid damp or wet loads and longer-than-expected drying times or unnecessary dryer repairs by following these three simple steps. Before each use, manually remove any accumulated lint from the lint screen. To do this, open the lint door, remove the lint screen and, using the tips of your fingers (no water please! ), roll the lint away from the screen. If the lint door on your dryer is on the top of the machine, gently pull the screen toward you to remove it. If it is in the front of your machine, pull the screen straight up. Frequently clean the dryer lint trap with a long handled brush. Begin by purchasing a long handled brush (you don’t want to accidentally drop it into your dryer!) from your local hardware or home improvement store. Once again, carefully remove the lint screen and, as always, dispose of any attached lint. Next, gently and without forcing it, push the brush into the lint trap to clean and collect lint from all of the nooks and crannies of the dryer lint trap area. The big pieces will stick to the brush and come out of the dryer when you pull the brush back out. To remove the few leftover smaller pieces, simply replace the lint screen, close the lint door and run the dryer on the “air fluff” or “no heat” setting. The small bits of loosened lint will go out of the house through the exhaust pipe. You can periodically wash the dryer lint screen to remove laundry detergent or fabric softener residue. As above, begin by removing the lint screen and rolling any accumulated lint from the screen with your fingertips. When all of the lint is off, wet the screen with hot water. Next, using a nylon scrubbing brush wet with hot water and liquid detergent, scrub both sides of the lint screen. Thoroughly rinse the screen in hot water and then inspect the screen to make sure that no residue remains. If there is any left, repeat the scrub and rinse and when you are confident that the screen is clean, dry it carefully with a clean towel and return it to the dryer. Check the screen for residue on a regular basis and when you see a build up occurring, wash it again. Make these quick and easy steps a routine part of your dryer maintenance to improve the performance of your machine, save you money and keep your home safe. Tip: If soap or fabric softener residue regularly builds up on the Dryer lint trap try using a little less on every washer load. 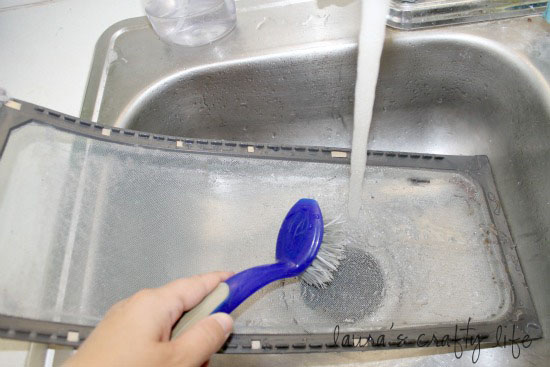 High Efficiency washers don't need too much soap or softener to do a great job. Check out the video below for more information on cleaning your dryer lint trap. After you've followed these steps to clean your lint trap if your Dryer is still drying slowly give the professionals at Calgary Appliance Force a call and we'll diagnose the problem and repair your unit quickly and affordable. Our expert technicians are manufacture trained and we offer a full guarantee on parts and service.